Way-too-early Pac-12 football predictions: Can Washington rule the North once again? Unlike last season, there's no clear favorite in the North. The Huskies were hit hard by departures, and Oregon is on the rise again. Is there a shifting of power in the conference's dominant division? Seven months out, there are no signs of a shift in Pac-12 power: The North should be the superior division in 2019, and perhaps, once again, by a significant margin. What could change, however, is the balance within the divisions. The North possessed a heavy favorite in 2018, and Washington eventually emerged with its second title in three years. In contrast, the South looked cluttered from the start and only devolved into chaos. Analysis | How does UW's QB situation measure up with rest of the Pac-12? Analysis | Who's rising and who's falling in Pac-12 recruiting ranks? Analysis | Ranking Pac-12 strength of schedules: Who has the hardest road? The North has a handful of teams capable of winning the division and the conference, while the South possessing an easily identifiable team to beat. Just 213 days until kickoff. Note: The following projections will be revised after spring practice/transfer decisions and then again prior to the season. 1. Oregon (9-4, 5-4): At this point, the Hotline leans green. Justin Herbert and five returning starters up front should make for one of the best quarterback-line combinations in the country. Plenty to like defensively, as well, with Jordon Scott and Troy Dye up the middle and cornerbacks Thomas Graham and Deommodore Lenoir on the edge. If not for concerns about consistency of effort and the staff’s ability to maximize offensive personnel, the Ducks would be the clear favorite. 2. 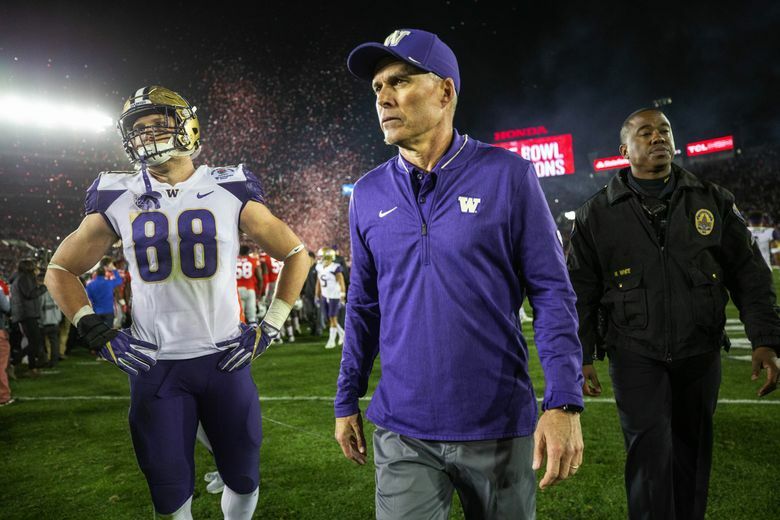 Washington (10-4, 7-2): Gave strong consideration to picking UW for the fourth consecutive year, but the attrition on defense and uncertainty at quarterback are significant. Jacob Eason could take the offense to a different level, or he could struggle to adjust after not playing for two years. As well as the Huskies have recruited on defense, as expertly coached as they might be, no team loses nine starters without feeling the impact. Also: Myles Gaskin was a stud. 3. Washington State (11-2, 7-2): The case for WSU as division winner is tougher to make because of the insurmountable wall that is the Apple Cup and because of the Cougars’ uncertainty at quarterback relative to Oregon. That said, they’re clearly a contender with the Leach system firmly in place, loads of receivers, impressive young tailback Max Borghi and a sound defensive scheme. Not to be overlooked: The road schedule (Seattle, Eugene, Salt Lake City, Berkeley and Tempe) is daunting. 4. Stanford (9-4, 6-3): The Cardinal took advantage of its odd-year schedule to win the North in ’13, ’15 and ’17, but there are personnel issues that didn’t previously exist. Substandard run blocking by the offensive line last season forced Stanford to lean on its passing game, but key pieces to the aerial attack are gone (as is tailback Bryce Love). Unless a new wave of playmakers emerges to assist quarterback K.J. Costello, points could be sparse. And the defense hasn’t been dominant for years. 5. Cal (7-6, 4-5): So much to like about the Bears’ prospects for 2019 and one thing … one very, very important thing … to make us wary of picking them to break into the top four of a stacked division. If the offense is merely decent, if it doesn’t serve as an obstacle to victory, then third-year coach Justin Wilcox could have a contender. But until we see otherwise from Wilcox and his offensive staff, the presumption here is more dysfunction. And more mediocrity. 6. Oregon State (2-10, 1-8): The easiest pick for any position in either division is OSU for last place in the North, a state of affairs based in equal parts on the Beavers’ competition and their depth chart. We though Jonathan Smith did solid work in Year One, and yet so outclassed in personnel was OSU that all eight conference losses came by multiple touchdowns. The gap is far too wide for OSU to close in a single offseason. 1. Utah (9-5, 6-3): Easy pick to win the division with only one unit, the retooled offensive line, as a cause for concern. Tyler Huntley, Zack Moss and Britain Covey are back to lead an attack that should function smoothly under new-old playcaller Andy Ludwig. Defensively, the Utes were hit hard by attrition at linebacker and safety but should be outstanding on the edge and up front. All those years without a South title, and now the Utes are in prime position to be the first team to win two in a row. 2. UCLA (3-9, 3-6): The Bruins improved dramatically as 2018 unfolded, were a handful of plays from winning five games and return the bulk of their depth chart on both sides of the ball. We expect the trajectory to improve with quarterback Dorian Thompson-Robinson, tailback Josh Kelley and a veteran line creating one of the top running games in the conference. The defense won’t be elite but doesn’t have to be for the Bruins to compete in this division. 3. Arizona State (7-6, 5-4): The departures of N’Keal Harry and Manny Wilkins leave voids that will impact everyone else, including and especially tailback Eno Benjamin. The Sun Devils should be solid on defense after playing so many freshmen in 2018, but our primary question is the margin for error. ASU committed just 11 turnovers last season, by far the fewest in the conference. A modest uptick in that regard — with a new quarterback — makes us skeptical of significant bottom-line improvement. 4. USC (5-7, 4-5): So much uncertainty, and yet it wouldn’t take that much improvement for the Trojans to reclaim the division they won in ’15 and ’17. The defense has elite playmakers on every level (Christian Rector, Palaie Gaoteote, Talanoa Hufanga), but we view the offense with deep skepticism until proven otherwise. The potential for collapse is significant given coach Clay Helton’s seemingly fragile job security — that’s the perception, which makes it the reality — and the Trojans’ brutal early-season schedule. 5. Arizona (5-7, 4-5): A year ago in this space, we pegged the Wildcats for second place. Not again. Too much went wrong in too many regards for us to presume Kevin Sumlin’s coaching and Rich Rodriguez’s players are suited for each other. That uncertain dynamic begins with quarterback Khalil Tate, of course, but the lines of scrimmage are a concern, as well. Then again, plenty of opportunity for upward movement exists in a division stocked with mediocrity. 6. Colorado (5-7, 2-7): We think Mel Tucker’s approach — SEC size, SEC power — will suit the Buffaloes well over the long haul, and Mike MacIntyre did not leave a barren roster behind. With Steven Montez, Laviska Shenault, Mustafa Johnson and Nate Landman, the Buffaloes have all-conference talent, plus loads of returning starters elsewhere. If everything breaks right, CU could finish third or fourth. Jon Wilner: jwilner@bayareanewsgroup.com; on Twitter: @wilnerhotline. Jon Wilner has been covering college sports for decades and is an AP top-25 football and basketball voter as well as a Heisman Trophy voter. He was named Beat Writer of the Year in 2013 by the Football Writers Association of America for his coverage of the Pac-12, won first place for feature writing in 2016 in the Associated Press Sports Editors writing contest and is a five-time APSE honoree.